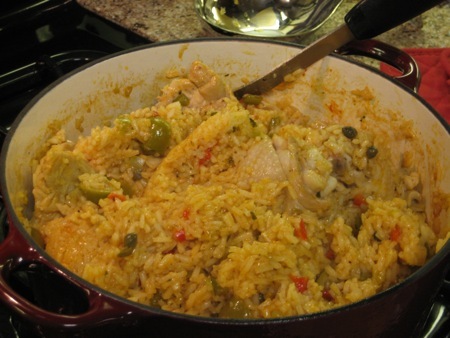 I was actually inspired to make Arroz con Pollo after watching an Ingrid Hoffman episode where she sashayed her way through the traditional Latin dish in record time. Instead of using her recipe, which unfortunately had a few less than stellar reviews as well as ingredients that seemed a little out of place to me, (including ketchup and green beans) I opted to try the Cooks Illustrated version of the dish. It took forever to make. From the time I started chopping to the time that I served dinner I “slaved” over the stove for more than 2 hours. I was so excited to try this savory cilantro and pepper flavored chicken and rice, but by the time it was actually plated I was practically falling asleep at the table. Not to mention that I munched on plump cocktail olives intermittently the whole time I was prepping and totally ruined my appetite. I’m an olive addict. It’s humanly impossible for me to eat just one. My dilemma now is that I can’t eat the leftovers. 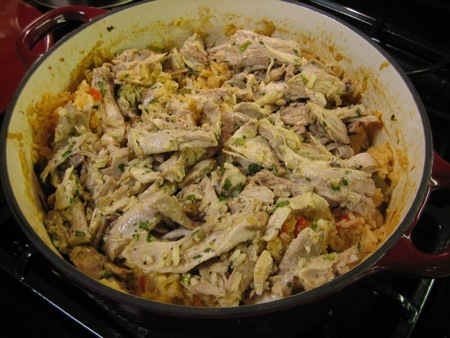 There’s a gigantic Chefmate Dutch Oven full of Arroz con Pollo in my refrigerator and every time I think about it I feel queasy. Thankfully Chris thinks it’s great and has been kind enough to eat a bowl for dinner the last few evenings. Does this ever happen to you? I remember when I first started cooking sometimes if I had to handle poultry too much I’d get freaked out and not be able to eat whatever I made. I suppose this is some weird residual food anxiety on my part so please don’t let my ridiculous taste buds color your judgment. I did thoroughly enjoy an entire bowl of the dish initially (especially those delightful olives). I made two slight alterations to the recipe below. For color purposes I added a whole diced red pepper in addition to the green pepper, and I also used olives stuffed with pimentos instead of separate amounts of olives and pimentos. Heat 1 tablespoon oil in Dutch oven over medium heat until shimmering. 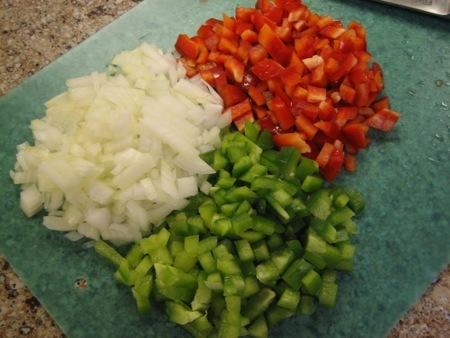 Add onion, green pepper, and pepper flakes; cook, stirring occasionally, until vegetables begin to soften, 4 to 8 minutes. Add 2 tablespoons cilantro; stir to combine. 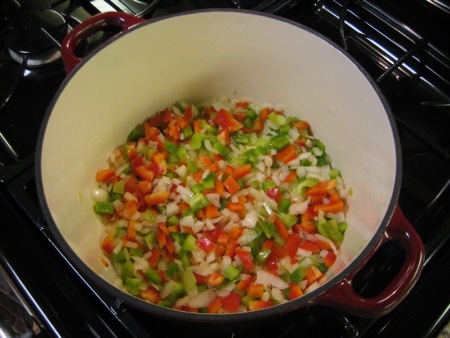 Push vegetables to sides of pot and increase heat to medium-high. Add chicken to clearing in center of pot, skin side down, in even layer. 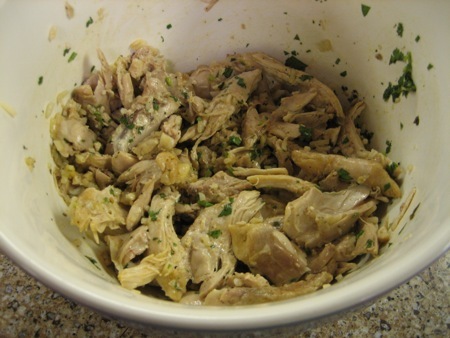 Cook, without moving chicken, until outer layer of meat becomes opaque, 2 to 4 minutes. 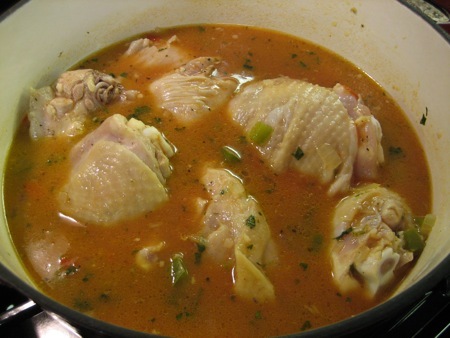 (If chicken begins to brown, reduce heat to medium). Using tongs, flip chicken and cook on second side until opaque, 2 to 4 minutes more. Add tomato sauce, broth, and water; stir to combine. Bring to simmer; cover, reduce heat to medium-low, and simmer for 20 minutes. Add rice, olives, capers, and 3/4 teaspoon salt; stir well. Bring to simmer, cover, and place pot in oven. After 10 minutes, remove pot from oven and stir chicken and rice once from bottom up. Return pot to oven. After another 10 minutes, stir once more, adding 1/4 cup water if rice appears dry and bottom of pot is beginning to burn. 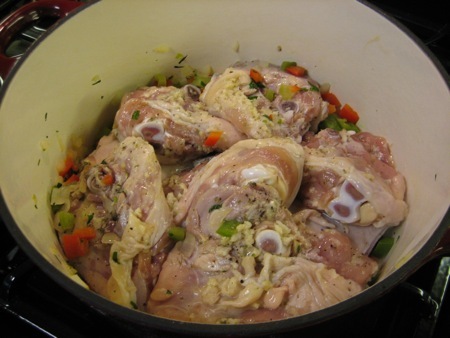 Cover and return pot to oven; cook until rice has absorbed all liquid and is tender but still holds its shape and temperature of chicken registers 175 degrees on instant-read thermometer, about 10 minutes longer. Using tongs, remove chicken from pot; replace lid and set pot aside. 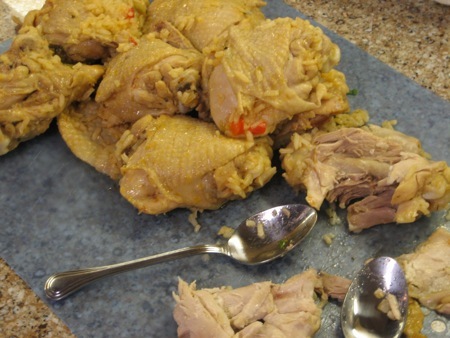 Remove and discard chicken skin; using 2 spoons, pull meat off bones into large chunks. 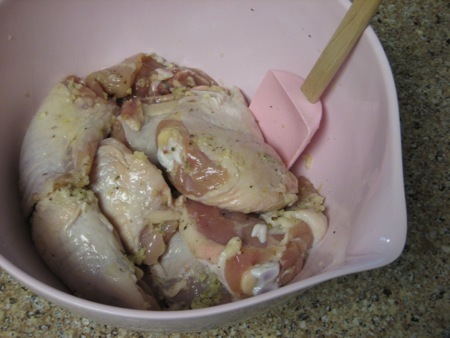 Using fingers, remove remaining fat or dark veins from chicken pieces. 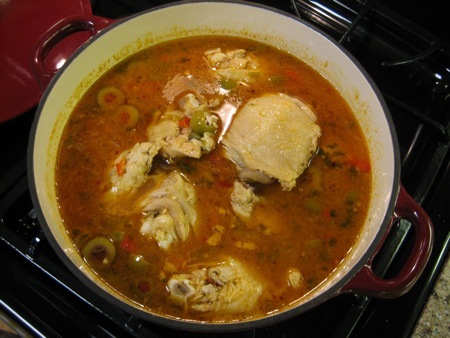 Place chicken in large bowl and toss with remaining tablespoon olive oil, remaining 2 teaspoons vinegar, remaining 2 tablespoons cilantro, and pimentos; season with salt and pepper to taste. Place chicken on top of rice, cover, and let stand until warmed through, about 5 minutes. Serve, passing lemon wedges separately. 1. 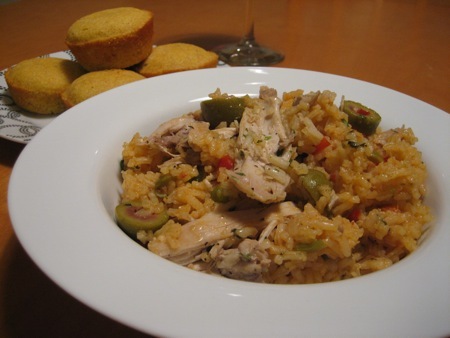 Being Latin myself and really knowing how to cook–no Latin puts ketchup in their arroz con pollo! Ergo, I’m not crazy about her or her show at all. 2. I see you added stuffed olives to save from having to use separate pimentos. The purpose of separate pimentos is not only for flavor but for garnish and plating. Much like their used in paella, they pop really nicely against the yellow. 3. Do you have a rice cooker? This would cut down the amount of time it took you to prepare it. 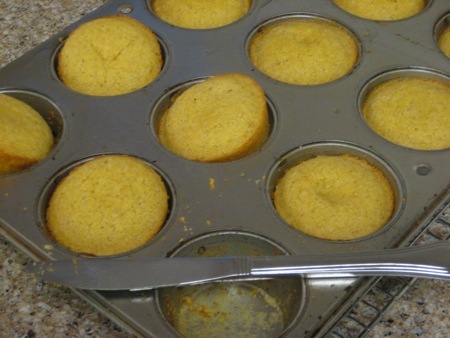 Baking is sooo not necessary. I’m sorry this really good dish scared you and made you think twice…I’d love to share my recipe with you. When I post it up, I’ll let you know! I know…Ingrid Hoffman is a little frightening. Sort of like a latin Sandra Lee. My boyfriend is actually Puerto Rican and he liked the Cooks Illustrated recipe (obviously it wasn’t as good as his mother’s) but honestly sometimes when I cook something really involved and time consuming the thought of eating it will totally gross me out. Like I’ve been enmeshed in the ingredients for so long that I’m physically repulsed by them. Anyway, I’d love to try your recipe! Looking forward to seeing it in the future. This was a delightful dish. It was time consuming starting off with stovetop cooking then transferring to oven cooking…i think that’s why the rice didn’t cook so well. It took additional time & water to cook the rice in the oven. All in all it was very flavorful, colorful, and pleasantly satisfying.